G protein-coupled receptors (GPCRs) play a major role in signal transduction and are targets of many therapeutic drugs. The regulator of G protein signaling (RGS) proteins form a recently identified protein family, and they strongly modulate the activity of G proteins. Their best known function is to inhibit G protein signaling by accelerating GTP hydrolysis [GTPase activating protein (GAP)] thus turning off G protein signals. RGS proteins also possess non-GAP functions, through both their RGS domains and various non-RGS domains and motifs (e.g., GGL, DEP, DH/PH, PDZ domains and a cysteine string motif). They are a highly diverse protein family, have unique tissue distributions, are strongly regulated by signal transduction events, and will likely play diverse functional roles in living cells. Thus they represent intriguing, novel pharmacological/therapeutic targets. Drugs targeting RGS proteins can be divided into five groups: 1) potentiators of endogenous agonist function, 2) potentiators/desensitization blockers of exogenous GPCR agonists, 3) specificity enhancers of exogenous agonists, 4) antagonists of effector signaling by an RGS protein, and 5) RGS agonists. In addition, a novel subsite distinction within the RGS domain has been proposed with significant functional implications and defined herein as “A-site” and “B-site”. Therefore, RGS proteins should provide exciting new opportunities for drug development. G protein-coupled receptors (GPCRs) play a major role in signal transduction and are the targets of a large number of therapeutic drugs. Just as our understanding of receptor, G protein, and effector function seemed nearly complete, a new kid appeared on the scene injecting fresh life into the field. The regulator of G protein signaling (RGS) proteins modulate the activity of G proteins in vitro, and evidence is beginning to emerge on their role in vivo as well. Their best known function is to inhibit G protein signaling by accelerating GTP hydrolysis thus turning off G protein signals (Berman et al., 1996a)1. They are a highly diverse protein family, have unique tissue distributions, and are strongly regulated by signal transduction events. Also, evidence is emerging that besides G protein inhibition, they can enhance G protein activation, serve as effectors, and act as scaffold proteins to gather receptors, G proteins, effectors, and other regulatory molecules together. There have been several excellent reviews on RGS proteins recently (Hepler, 1999; Siderovski et al., 1999; De Vries et al., 2000; Ross and Wilkie, 2000), so we will focus on known or predicted physiological functions of RGS proteins and on concepts related to RGS proteins as potential drug targets (see also Jones et al., 2000 and Dohlman, 2001). The RGS proteins were discovered in genetic studies of GPCR signaling pathways in model organisms (Dohlman and Thorner, 1997). The scope and significance of RGS proteins were recognized in 1996 when ∼20 mammalian members of the RGS protein family were identified based on sequence homologies with a conserved 120-amino acid domain in the original yeast and worm RGS proteins, Sst2 and EGL-10, respectively (Druey et al., 1996; Koelle and Horvitz, 1996; Siderovski et al., 1996). Later in 1996, several groups showed that RGS proteins were GTPase accelerating proteins (GAPs)2 (Berman et al., 1996a). The crystal structure of a Gαi1-RGS4 suggested a mechanism for the GAP activity: stabilization of the transition state conformation of Gα (Berman et al., 1996b). The GAP activity explains RGS-mediated inhibition of G protein signaling. It also explains the paradox that some signals, visual responses and cardiac potassium channels (Szabo and Otero, 1989; Arshavsky et al., 1994), turn off much faster than expected given the slow hydrolysis of GTP by purified Gα subunits. Recently, there has been a paradigm shift in thinking about RGS proteins (Hepler, 1999; Siderovski et al., 1999). In addition to GAP activity, RGS proteins also: 1) directly antagonize Gα effectors (Hepler et al., 1997; Tesmer et al., 1997), 2) bind Gβ5 (Snow et al., 1998b), 3) potentially target protein kinase A and receptor kinases since AKAP contains an RGS-like domain and is a predicted RGS family member (Koch et al., 1993; Huang et al., 1997), 4) scaffold Wnt signaling proteins (reviewed in Kikuchi, 1999), 5) are Gα13 effectors activating Rho (Hart et al., 1998; Kozasa et al., 1998), and 6) enhance receptor-G protein coupling (see below). Thus, we should think of RGS domains as modular, regulatable,Gα subunit recognition domains along the lines of SH2, SH3, or PDZ domains. As SH2 domains only bind tyrosine-phosphorylated peptides, RGS binding to Gα depends on the Gα functional state. For example, RGS4 binds only to the (AlF4−-bound) transition state of Gαi1 subunits, while RGS2 binds both transition state and active (GTPγS-bound) Gαq, and neither of them binds to the resting state of Gα (Berman et al., 1996b; Heximer et al., 1997). This produces state-dependent recruitment of the RGS protein to the vicinity of Gα subunits. Effector antagonism uses the RGS domain (Hepler et al., 1997; Tesmer et al., 1997), but most other non-GAP functions involve functional domains in N- and C-terminal extensions. The wide array of domains found in RGS proteins has been reviewed recently (Hepler, 1999; Siderovski et al., 1999; De Vries et al., 2000) and includes GGL (G protein γ-subunit-like), DEP (disheveled, egl-10, pleckstrin), DH/PH (Dbl/pleckstrin homology) and PDZ (PSD-95, disc-large, and ZO-1 homology) domains. These non-RGS components of the RGS-containing proteins serve to link other proteins and signaling pathways (Fig.1). When RGS binds to Gα, it carries with it other functional units providing a great diversity of protein-protein interactions as described in the reviews cited above. Recent studies suggest evidence for RGS interactions with receptors, providing additional specificity of RGS actions. A PDZ domain in the amino terminus of RGS12 binds selectively with the carboxyl terminus of the IL-8 receptor (Snow et al., 1998). Also, RGS4, in the context of intact cells, can selectively inhibit calcium signals induced by muscarinic versus cholecystokinin receptors, and this specificity is dependent on the amino-terminal extension of RGS4 (Zeng et al., 1998a). Moreover, the specificity of RGS4 for α-subunits is modified in the context of a receptor-Gα fusion protein (Cavalli et al., 2000). All of these results indicate that RGS specificity will depend on factors outside of the RGS-Gα interface. Furthermore, RGS proteins can accelerate the activation as well as the deactivation of receptor-stimulated G protein-coupled inwardly rectifying potassium (GIRK) currents (Doupnik et al., 1997; Saitoh et al., 1999) (for more references, see Ross and Wilkie, 2000). The GAP function of RGS explains the temporally enhanced deactivation and activation, but the fact that this acceleration is not accompanied by an expected decrease in the amplitude of stimulated currents suggests that RGS may have additional positive functions in receptor signaling. We recently found (H. Zhong, S. M. Wade, and R. R. Neubig, submitted) that RGS4 can enhance α2-adrenergic receptor-stimulated GTPγS binding, acting as a positive kinetic modulator in receptor-G protein coupling. Another possibility is that the GGL domain containing RGS proteins may actually act as Gγ proteins to allow receptor-G protein coupling. The above information implies a direct or indirect interaction of the RGS with receptor as well as with the G protein and provides further support for receptor-specific actions of RGS proteins. These results show that RGS proteins can also enhance receptor signaling, and the net effect must be determined from studies of intact physiological systems. A large number of studies (reviewed in De Vries et al., 2000) have demonstrated that RGS proteins, when ectopically expressed in mammalian cells, can suppress G protein signaling. In Table1, we summarize the functional aspects of known RGS proteins. Despite extensive overexpression data, much less is known about the physiological role ofendogenous RGS proteins. The model organisms,Saccharomyces cervesiae and Caenorhabditis elegans, have provided the best evidence for functional roles of RGS proteins. In both cases, loss of RGS protein function leads to hyperstimulation of the signaling pathway, consistent with a primary action via the GAP activity of the RGS protein to suppress G protein signaling. In mammalian systems, there is little direct information on the roles of endogenous RGS proteins (Table 1). Recently, Jeong and Ikeda (2000)used RGS-insensitive mutants of Gαo (Lan et al., 1998) to show that α2-adrenergic inhibition of N-type calcium currents in rat sympathetic ganglia is markedly inhibited byendogenous RGS proteins. When RGS-insensitive Gαo subunits were expressed, the rate of Ca2+ channel recovery from norepinephrine-induced inhibition was much slower (50–60 s versus 10 s) presumably due to the inability of endogenous RGS proteins to GAP the mutant Gαo. As a critical proof-of-principle for the use of RGS inhibitor drugs, dose-response curves for norepinephrine were left-shifted 6- to 8-fold by expression of the RGS-insensitive Gαo subunits. The effect of these RGS-insensitive Gα subunit mutations should be the genetic equivalent of blocking the RGS-Gα interaction pharmacologically. Thus RGS inhibitors should lead to enhanced responses to physiologically released or pharmacologically administered agonists. Thus the endogenous levels of RGS proteins, at least in neurons, appear sufficient to influence steady-state ion channel responses through G protein-coupled receptors. The only reported RGS “knockout” shows that endogenous RGS9-1 (alternative splicing product of RGS9 gene, the other product being RGS9-2; see also Table 1) rapidly deactivates transducin in vivo (Chen et al., 2000). In homozygous RGS9-1 knockout mice, the half-time for single photon responses was greatly prolonged (∼3 s versus ∼0.5 s). An RGS2 knockout exhibits an “anxious” behavioral phenotype, and an RGS14 knockout shows embryonic lethality at the preimplantation stage demonstrating clear functions for these proteins (D. Siderovski, personal communication). Further genetic studies are likely to provide important insights into the physiological functions of different RGS proteins in the near future. Some additional physiological functions have not yet been proven but could be predicted based on the known biology of RGS protein regulation. The mRNA and/or protein levels of many RGS proteins exhibit rapid induction following physiological signals (for review, seeHepler, 1999; Siderovski et al., 1999; De Vries et al., 2000; Ross and Wilkie, 2000). The yeast RGS protein, Sst2, is up-regulated upon stimulation of yeast by the alpha factor mating pheromone, and this up-regulation leads to a rapid inhibition of pheromone signaling (Dohlman et al., 1996). Deletion of the SST2 gene leads to a 100-fold enhancement in sensitivity to alpha factor. The mammalian RGS proteins, RGS1 and RGS2, were originally discovered due to the up-regulation of their mRNA levels in immune cells (De Vries et al., 2000). Several studies have demonstrated enhanced mRNA expression of RGS2 by increased cAMP levels (Pepperl et al., 1998) or angiotensin II receptors (Grant et al., 2000; Table 1). Since RGS2 is relatively selective for Gαq, it will be very interesting to determine the role of RGS2 up-regulation in the commonly observed rapid tachyphylaxis to angiotensin II and other activators of phospholipase C (PLC). Additionally, the nuclear localization of some RGS proteins when overexpressed in cells (RGS2, RGS3T, and RGS10) (Chatterjee and Fisher, 2000; Dulin et al., 2000) may suggest a role in regulating gene activation. RGS proteins may also participate in desensitization or tolerance to opioids (Potenza et al., 1999). Rapid tolerance develops to opioids and many RGS proteins act on the Gαi/Gαo family G proteins (the main targets of opioid receptors). Thus it will again be very interesting to determine whether RGS proteins play a significant role in opioid desensitization, tolerance, and dependence. Physiological Relevance of “Positive” Signaling Properties of RGS Proteins. Several RGS proteins (such as p115-RhoGEF and Axin) play active roles in transmitting receptor signals to downstream effectors. Several GPCRs can activate Rho including receptors for thrombin (PAR2), lysophosphatidic acid (edg2 and 4), sphingosine-1-phosphate (edg3 and 5), thromboxane A2, and endothelin (Sah et al., 2000). Interestingly, several guanine nucleotide exchange factors for Rho (p115-RhoGEF, PDZ-RhoGEF, and KIAA380) contain an RGS-like domain that selectively interacts with Gα12 or Gα13 (Kozasa et al., 1998). In particular, purified p115-RhoGEF binds to and stimulates the GTPase activity of both Gα12 and Gα13, and GTPγS-bound Gα13 stimulates activity of purified p115-RhoGEF (Hart et al., 1998; Kozasa et al., 1998). Thus, p115-RhoGEF appears to serve as a direct effector for Gα13, transferring the signal from a GPCR-activated heterotrimeric G protein to the low-molecular weight G protein, Rho. This mechanism fits very well with the large body of literature showing that activation of Gα12 and Gα13 causes Rho-dependent changes in cell shape and growth properties (Sah et al., 2000). Axin, a component of the Wnt signaling system important in embryonic development, organogenesis, and cancer (Wodarz and Nusse, 1998; Peifer and Polakis, 2000), contains a functionally important RGS domain. Signals from the ligand (Wnt) and receptor (Frizzled) to downstream components such as Axin, glycogen synthase kinase 3 (GSK3), adenomatous polyposis coli protein (APC), and β-catenin are poorly understood. APC is a known tumor suppressor, and β-catenin is an oncogene. Axin, in complex with APC and GSK3, negatively regulates the transcription factor β-catenin, in part by causing its ubiquitination and degradation (Wodarz and Nusse, 1998). Wnt binding to its receptor, Frizzled, relieves this inhibitory effect thus increasing levels of active β-catenin. The recent crystal structure of an Axin/APC complex revealed that APC binds to the RGS domain of Axin (Spink et al., 2000). Interestingly, the site of the Axin-APC interaction on the RGS domain is distinct from the site at which Gα subunits bind to RGS proteins (Fig. 2). 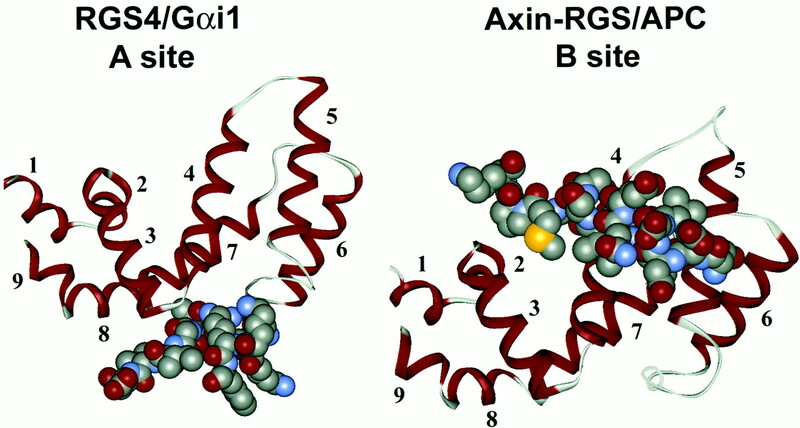 Based on these structures, it would be appropriate to define at least two interaction sites on the RGS domain—an “A-site” for Gα subunit and a “B-site” on the back of the RGS domain where APC binds Axin. This provides two distinct pharmacological targets on the RGS domain that may exhibit different pharmacological responses. The A-site on Axin, however, is only hypothetical since the RGS domain of Axin has not yet been reported to act on a Gα as other RGS proteins do. Two protein interaction regions on the RGS domain. The crystal structures of two RGS domains have been solved in complex with their interaction partners. Left, the Gαi1-RGS4 crystal structure (1AGR on http://www.rcsb.org) delineates the contacts between the conformationally sensitive “switch” regions of the Gα subunit (spacefill amino acids 180–186 and 207–211) and RGS4 (ribbon). The contacts occur on RGS4 at the loops between the numbered α helices 3/4, 5/6, and 7/8. This region of the classical RGS proteins, which we term the “A site”, is highly conserved and interacts with the α-subunit (most of which is not shown but lies below the switch regions in the structure). Right, the crystal structure of the Axin RGS domain in complex with a peptide fragment (amino acids 2035–2050) of the APC protein (1EMU on http://www.rcsb.org) delineates a second site on the back of the RGS domain, which we term the “B site”. The APC site contacts helices 4 and 5 near their junction and the loop between helices 2 and 3. Another recent observation related to the B-site has to do with PIP3 as a potential physiological inhibitor of RGS (Popov et al., 2000). PIP3 binds to RGS4 and RGS16 and inhibits RGS4 GAP activity. This appears to involve α helix 5 of RGS4 in the B-site. Furthermore, calmodulin binds to the same site and relieves the PIP3-mediated inhibition. This potential physiological regulatory mechanism could be a useful target for therapeutic intervention as discussed below. It is clear that RGS proteins do play important physiological roles in G protein function, some fairly predictable based on existing information. Other functions are likely to involve novel interactions and/or mechanisms. Thus, we are just scratching the surface in defining the physiological roles of RGS proteins, and many completely unpredictable actions will probably be revealed over the next few years. In thinking about therapeutic uses of RGS-directed drugs, we must consider site of action on the protein, cellular mechanism, and relation to (or interaction with) known pharmacological agents. The most obvious drug design would be an inhibitor of RGS interaction with Gα subunits. We denote this site on RGS the A-site. Such a drug would be expected to block RGS actions that depend on Gα binding. Inhibition of the GAP activity should increase the effect of the Gα subunit and increase the sensitivity of any tissue expressing that RGS protein to agonists activating that G protein. This is similar to agonist potentiators such as the benzodiazepines at the GABA-A receptor. In addition to the classical effect of RGS as a GAP, some RGS domains are also effector antagonists or can presumably localize other inhibitory molecules (e.g., GRK2 or GRK3) to the site of receptor-activated G proteins. In both of these cases, a drug binding to the RGS A-site would potentiate agonist signaling by both endogenous and exogenous agonists. For an RGS that serves as an effector (e.g., p115-RhoGEF), an RGS A-site inhibitor would be an antagonist of that particular pathway. Since Rho activation is involved in cell proliferation (Peifer and Polakis, 2000) and metastasis (Clark et al., 2000), this could represent a useful site for anticancer or antimetastatic agents (see below). Thus, RGS A-site inhibitors could either lead to enhancement or inhibition of the signaling pathway, depending on the specific role of that RGS protein. Drugs acting at the RGS B-site could potentially serve either as RGS inhibitors or as RGS activators. In the Wnt signaling system, a drug that could inhibit β-catenin function could be very useful in cancer therapy. An Axin B-site inhibitor would block the Axin-APC interaction and inhibit the ability of the Axin/APC/GSK3 complex to down-regulate β-catenin. Unfortunately, β-catenin is oncogenic, so this would not be a desirable action for developing anticancer agents. If a G protein α-subunit binding to the A-site on the Axin RGS domain stimulated APC release from the B-site, then inhibition at the Axin RGS A-site might be useful for cancer therapy by disrupting growth signals from the Wnt pathway. A potentially novel effect of a drug at the RGS B-site would be to serve as an “RGS agonist”. If endogenous lipid mediators suppress RGS action, then preventing the binding of that lipid would stimulate RGS function and decrease signaling through the pathway. Such a drug would act in a manner similar to that proposed for the endogenous regulator calmodulin (Popov et al., 2000). Such an RGS agonist could lead to reductions in Gαo, Gαi, or Gαq signaling. One aspect of RGS proteins that differentiates them from G proteins as potential drug targets is their incredible structural diversity. As noted in Table 1, there are a number of other interaction motifs beyond the RGS domain that could be targeted in drug design. This could include the DH/PH domains of the p115-RhoGEF family, the AKAP domain of D-AKAP2, and the PDZ domain of RGS12, which targets IL-8 receptors (Snow et al., 1998a). Specifically, inhibitors of RGS12 PDZ domain could produce more specific effects than inhibitors of the RGS domain itself. This would result from the lack of effect of a PDZ inhibitor on the short forms of RGS12 (which lack the PDZ domain), and such an inhibitor would also only affect those receptors that were directly targeted by RGS12 localization. Further discussion, however, will focus on drugs targeting the RGS domain itself, either on the A-site or the B-site. There are at least four different ways in which RGS inhibitors could be used either alone or in combination with other drugs: 1) RGS inhibitors could be used as potentiators of endogenous agonist function similar to the action of benzodiazepines at the ionotropic GABA-A receptor (Macdonald and Olsen, 1994). 2) They could also be used to potentiate the action of or block desensitization to exogenously administered GPCR agonists. This may be especially useful in the case of agonists for which rapid desensitization of responses occurs such as opioid analgesics. 3) They could be used tomodify and/or increase the specificity of an exogenously administered agonist. 4) They could block effector signaling by an RGS protein (e.g., Rho GEF or APC activation). The inhibitor could be targeted to the RGS domain itself or to other domains that are critical for interactions with other signaling molecules (e.g., PDZ or GEF domains). The dramatic increase in sensitivity to epinephrine-mediated Ca2+ channel inhibition in rat superior sympathetic ganglion neurons (Jeong and Ikeda, 2000) when RGS function is abrogated suggests that RGS antagonists could significantly enhance the function of endogenous neurotransmitters. This would mainly occur for receptors coupled to Gαi or Gαq signaling pathways as there is no strong evidence for an RGS effect on a Gαs family member. Thus, actions of the inhibitory adrenergic receptors (α2-adrenergic receptors) on cAMP levels would be enhanced at the expense of the stimulatory adrenergic receptors (β-adrenergic receptors). A particularly striking example in which an RGS inhibitor might be more specific than a receptor agonist is RGS9-2, which is highly localized in the caudate putamen (Gold et al., 1997). An RGS9-2 inhibitor could enhance D2 dopamine action with potential anti-Parkinsonian effects. Similarly, RGS inhibitors targeting brain regions involved in pain control such as the peri-aqueductal gray region (e.g., RGS8, RGS7, or RGS4) might serve as novel analgesics or analgesic potentiators. If regions involved in reinforcement behaviors such as ventral tegmental area or nucleus accumbens had less of this RGS protein (e.g., RGS4 or RGS7), then the actions of opioids could target the desired analgesic effect while reducing potential dependence liability. Similarly, many receptors acting through Gαo- or Gαi-mediated signaling pathways (e.g., GABA-B receptors for muscle relaxants) could be potentiated in a tissue-specific manner by an RGS inhibitor. PLC is another potential target [e.g., serotonin agonists for treatment of migraine (Diener et al., 1999)]. Gq responses in cerebral vascular tissue (Grant et al., 2000) could be selectively potentiated depending on RGS proteins present in that tissue. Another intriguing but speculative possibility is suggested by the evidence that expressed RGS4 and RGS16 block translocation of the glucose transporter (Glut4) to the plasma membrane in 3T3-L1 adipocytes (Kanzaki et al., 2000; Table 1). If an endogenous RGS tonically inhibits Glut4 translocation in vivo, then an inhibitor of that RGS could potentially be used in the therapy of type II diabetes. RGS1 inhibits signaling by platelet activating factor, stromal-derived factor-1, and constitutively activated Gα12 (Moratz et al., 2000; Table 1). An inhibitor of RGS1 might be a novel immune stimulant for use in acquired immunodeficiency syndrome or cancer by activating germinal center B lymphocytes, which are normally refractory to stromal-derived factor-1-triggered migration. Combination Exogenous Agonist/RGS Inhibitor Therapy. The combination of a classical GPCR agonist with an RGS inhibitor could: 1) potentiate the drug's effect as described above, 2) reduce desensitization and/or drug tolerance, or 3) target responses to particular tissues to reduce side effects. The practicality of the second effect will depend on the contribution of RGS proteins (as opposed to receptor kinases) in the desensitization process. Both mechanisms 1) and 2) are illustrated in the phenotype of yeast strains lacking Sst2p since they are sensitive to much lower doses of pheromone than are wild-type strains, plus they display a persistent growth-arrest in response to pheromone, while the wild-type strains rapidly recover from growth-arrest. An RGS inhibitor could provide a tissue-specific targeting of the action of an agonist that stimulates many different tissues. A major problem with apomorphine or other D2 dopaminergic agonists in Parkinson's disease is side effects on peripheral tissues. Apomorphine is given with a peripherally acting D2 blocker to reduce these side effects (O'Sullivan and Lees, 1999). Alternatively, an inhibitor of RGS9-2 could be given with apomorphine or other D2 agonists to potentiate agonist effects in the desired tissue (caudate putamen) thus improving selectivity by reducing undesirable effects occurring in other tissues. In addition to tissue-specific effects, RGS inhibitors could provide pathway-directed targeting of a drug responses. A muscarinic agonist for treatment of Alzheimer's disease (which has side effects on many tissues) could be combined with an inhibitor of an RGS in the brain region of interest to locally potentiate the agonist action. Depending on the nature of the RGS proteins present, it may also be possible to direct the agonist action to particular signaling pathways. Specifically, RGS2 has greater inhibitory effects on Gαq and PLC responses than on Gαi or Gαo responses (Heximer et al., 1999). The M1, M3, and M5 muscarinic receptors activate Gαq, while M2 and M4 activate Gαo and Gαi. Thus an RGS2 inhibitor would be expected to selectively enhance responses to the PLC-coupled M1, M3, and M5 receptors and could increase the selectivity of a partially selective M1 muscarinic agonist for M1 versus M2 receptor responses. The role of a RhoGEF RGS domain in receptor-stimulated Gα12/Gα13-mediated Rho activation is of potential significance. Gα12 and Gα13 can be oncogenes (Gutkind, 1998). Also, edg receptors stimulate cellular proliferation in response to serum-derived lipid signals such as lysophosphatidic acid and sphingosine-1-phosphate and are present in many cancer cell types such as breast, colon, lung, and melanoma (Fang et al., 2000). The leukemia-associated RhoGEF gene LARG has an RGS homology region as in p115-RhoGEF (Kourlas et al., 2000). Finally, a central role for RhoC in metastasis has just been identified (Clark et al., 2000). Thus drugs decreasing RhoGEF activity could be very useful anticancer agents. The RhoGEF domain is a compelling drug target, but this may have nonspecific effects. An inhibitor directed at the RGS domain of the p115-RhoGEF (or its homologs PDZ-RhoGEF, lsc, LARG, etc.) could block the effects of lipid mediators or other G protein-mediated signals to cell growth, anti-apoptosis, or metastasis. Targeting the RGS region of RhoGEFs may prove more specific and less toxic, at least in cancers where the growth stimulus involves a G protein signaling pathway, since this does not affect other RhoGEF subtypes in the genome that don't contain an RGS domain. The concept of RGS agonists is more speculative but is worth considering. Blocking interactions of endogenous inhibitors of RGS function such as PIP3 (see above) could serve to stimulate the GAP activity of RGS proteins leading to reductions in Gαo, Gαi, or Gαq signaling. Since many stimulatory ligands (e.g., chemokines, epinephrine, angiotensin, and endothelin) act through Gαi- or Gαq-stimulated phospholipase C activity, a drug that could suppress signaling in selective tissues could be very useful. Examples could include: 1) inflammatory conditions in which an RGS1 stimulator would block Gαi responses, and 2) hypertension and vascular restenosis in which an RGS2 stimulator could block Gαq signals. Development of this area will require additional understanding of the tissue localization, specificity, and basic regulatory processes governing the function of RGS proteins. Clearly, much more will be learned about RGS physiological functions, specificity, cellular and tissue localization, and potential as drug targets. Currently, this is a very exciting aspect of G protein-coupled receptor signaling. Given the critical importance of G proteins in physiological processes and their receptors as a locus of action for many useful therapeutic agents, it is highly likely that RGS proteins will provide new opportunities for drug development and specificity. Stay tuned! We thank Drs. Stephen Ikeda (Guthrie Research Institute, Sayre, PA) and David Siderovski (University of North Carolina, Chapel Hill, NC) for communicating unpublished results. We also thank Dr. John Hepler (Emory University, Atlanta, GA) for permission to reprint Fig.1. ↵1 Many important articles could not be cited in this paper due to the journal's policies limiting the number of references. We apologize to our colleagues whose papers could not be included due to these limitations. This work was supported by National Institutes of Health Grant GM 39561. ↵2 The abbreviation GAP (for GTPase accelerating protein) is used in several ways that may not please grammarians but does facilitate discussion of RGS function. The noun form “GAP” is commonly recognized and understood. A corruption that greatly simplifies speaking or writing about RGS proteins is the verb form “to GAP”, which means to accelerate GTP hydrolysis. Also, it is occasionally used as an adjective as in “GAP activities” or “non-GAP activities” meaning, respectively, functions that do or do not depend on acceleration of GTP hydrolysis. (1994) Regulation of transducin GTPase activity in bovine rod outer segments. J Biol Chem 269:19882–19887. (1999) Upregulation of RGS7 may contribute to tumor necrosis factor-induced changes in central nervous function. Nat Med 5:913–918. (1996b) The GTPase-activating protein RGS4 stabilizes the transition state for nucleotide hydrolysis. J Biol Chem 271:27209–27212. (1996a) GAIP and RGS4 are GTPase-activating proteins for the Gi subfamily of G protein α subunits. Cell 86:445–452. (2000) Importance of the autosomal recessive retinitis pigmentosa locus on 1q31–q32.1 (RP 12) and mutation analysis of the candidate gene RGS16 (RGS-r). J Med Genet 37:384–387. (1997) The p53 tumor suppressor targets a novel regulator of G protein signaling. Proc Natl Acad Sci USA 94:7868–7872. (1999) RGS mRNA expression in rat striatum: modulation by dopamine receptors and effects of repeated amphetamine administration. J Neurochem 72:1529–1533. (1999) Selective regulation of G alpha(q/11) by an RGS domain in the G protein-coupled receptor kinase, GRK2. J Biol Chem 274:34483–34492. (2000) The regulator of G protein signaling RGS4 selectively enhances alpha2A adrenoceptor stimulation of the GTPase activity of Go1alpha and Gi2alpha. J Biol Chem 275:23693–23699. (2000) Cytoplasmic, nuclear, and Golgi localization of RGS proteins—evidence for N-terminal and RGS domain sequences as intracellular targeting motifs. J Biol Chem 275:24013–24021. (2000) Slowed recovery of rod photoresponse in mice lacking the GTPase accelerating protein RGS9-1. Nature (Lond) 403:557–560. (2000) RGS14, a GTPase-activating protein for Gi alpha, attenuates Gi alpha- and G13 alpha-mediated signaling pathways. Mol Pharmacol 58:569–576. (2000) Genomic analysis of metastasis reveals an essential role for RhoC. Nature (Lond) 406:532–535. (1998) GIPC, a PDZ domain containing protein, interacts specifically with the C terminus of RGS-GAIP. Proc Natl Acad Sci USA 95:12340–12345. (2000) The regulator of G protein signaling family. Annu Rev Pharmacol Toxicol 40:235–271. (1999) Antimigraine drugs. J Neurol 246:515–519. Dohlman HG (2001) Regulators of G protein signaling. Encycl Mol Med, in press..
(1996) Sst2, a negative regulator of pheromone signaling in the yeast Saccharomyces cerevisiae: expression, localization, and genetic interaction and physical association with Gpa1 (the G-protein alpha subunit). Mol Cell Biol 16:5194–5209. (1997) RGS proteins and signaling by heterotrimeric G proteins. J Biol Chem 272:3871–3874. (1997) RGS proteins reconstitute the rapid gating kinetics of Gbetagamma-activated inwardly rectifying K+ channels. Proc Natl Acad Sci USA 94:10461–10466. (1996) Inhibition of G-protein-mediated MAP kinase activation by a new mammalian gene family. Nature (Lond) 379:742–746. (2000) Regulator of G protein signaling RGS3T is localized to the nucleus and induces apoptosis. J Biol Chem 275:21317–21323. (2000) Lysophospholipid growth factors in the initiation, progression, metastases, and management of ovarian cancer. Ann NY Acad Sci 905:188–208. (1997) Regulators of G-protein signaling (RGS) proteins: region-specific expression of nine subtypes in rat brain. J Neurosci 17:8024–8037. (2000) Specific regulation of RGS2 messenger RNA by angiotensin II in cultured vascular smooth muscle cells. Mol Pharmacol 57:460–467. (1999) Modulation of renal tubular cell function by RGS3. Am J Physiol 276:F535–F543. (1998) Cell growth control by G protein-coupled receptors: from signal transduction to signal integration. Oncogene 17:1331–1342. (1999) Antagonism between G(o)alpha and G(q)alpha in Caenorhabditis elegans: the RGS protein EAT-16 is necessary for G(o)alpha signaling and regulates G(q)alpha activity. Genes Dev 13:1780–1793. (1998) Direct stimulation of the guanine nucleotide exchange activity of p115 RhoGEF by Galpha13. Science (Wash DC) 280:2112–2114. (1999) Emerging roles for RGS proteins in cell signalling. Trends Pharmacol Sci 20:376–382. (1997) RGS4 and GAIP are GTPase-activating proteins for Gqα and block activation of phospholipase Cβ by γ-thio-GTP-Gqα. Proc Natl Acad Sci USA 94:428–432. (1999) G protein selectivity is a determinant of RGS2 function. J Biol Chem 274:34253–34259. (1997) RGS2/G0S8 is a selective inhibitor of Gqalpha function. Proc Natl Acad Sci USA 94:14389–14393. (1997) D-AKAP2, a novel protein kinase A anchoring protein with a putative RGS domain. Proc Natl Acad Sci USA 94:11184–11189. (1998) Dynamic regulation of RGS2 suggests a novel mechanism in G-protein signaling and neuronal plasticity. J Neurosci 18:7178–7188. (2000) Endogenous regulator of G-protein signaling proteins modify N-type calcium channel modulation in rat sympathetic neurons. J Neurosci 20:4489–4496. (2000) Non-binding site modulation of G protein-coupled receptor signaling. Expert Opin Ther Patents 9:1–14. (1999) Expression of RGS2 alters the coupling of metabotropic glutamate receptor 1a to M-type K+ and N-type Ca2+ channels. Neuron 22:819–829. (2000) The trimeric GTP-binding protein (G(q)/G(11)) alpha subunit is required for insulin-stimulated GLUT4 translocation in 3T3L1 adipocytes. J Biol Chem 275:7167–7175. (1999) Modulation of Wnt signaling by Axin and Axil. Cytokine Growth Factor Rev 10:255–265. (1999) Interaction between RGS7 and polycystin. Proc Natl Acad Sci USA 96:6371–6376. (1993) The binding site for the βγ subunits of heterotrimeric G proteins on the β-adrenergic receptor kinase. J Biol Chem 268:8256–8260. (1996) EGL-10 regulates G protein signaling in the C. elegans nervous system and shares a conserved domain with many mammalian proteins. Cell 84:115–125. (2000) Identification of a gene at 11q23 encoding a guanine nucleotide exchange factor: evidence for its fusion with MLL in acute myeloid leukemia. Proc Natl Acad Sci USA 97:2145–2150. (1998) p115 RhoGEF, a GTPase activating protein for Galpha12 and Galpha13. Science (Wash DC) 280:2109–2111. (1998) A point mutation in Galphao and Galphai1 blocks interaction with regulator of G protein signaling proteins. J Biol Chem 273:12794–12797. (2000) Regulator of G protein signaling 1 (RGS1) markedly impairs Gi alpha signaling responses of B lymphocytes. J Immunol 164:1829–1838. (2000) Regulation of T cell activation, anxiety, and male aggression by RGS2. Proc Natl Acad Sci USA 97:12272–12277. (1999) Use of apomorphine in Parkinson's disease. Hosp Med 60:816–820. (2000) Molecular cloning and characterization of a novel regulator of G-protein signaling from mouse hematopoietic stem cells. J Biol Chem 276:915–923. (2000) Wnt signaling in oncogenesis and embryogenesis—a look outside the nucleus. Science (Wash DC) 287:1606–1609. (1998) Regulation of RGS mRNAs by cAMP in PC12 cells. Biochem Biophys Res Commun 243:52–55. (2000) Ca2+/calmodulin reverses phosphatidylinositol 3,4,5-trisphosphate-dependent inhibition of regulators of G protein-signaling GTPase-activating protein activity J Biol Chem 275:18962–18968. (1999) Effects of regulators of G protein-signaling proteins on the functional response of the mu-opioid receptor in a melanophore-based assay. J Pharmacol Exp Ther 291:482–491. (1999) Cloning and characterization of RGS9-2: a striatal-enriched alternatively spliced product of the RGS9 gene. J Neurosci 19:2016–2026. (2000) GTPase-activating proteins for heterotrimeric G proteins: regulators of G protein signaling (RGS) and RGS-like proteins. Annu Rev Biochem 69:795–827. (2000) The role of rho in G protein-coupled receptor signal transduction. Annu Rev Pharmacol Toxicol 40:459–489. (1999) RGS7 and RGS8 differentially accelerate G protein-mediated modulation of K+ currents. J Biol Chem 274:9899–9904. (1996) A new family of regulators of G-protein-coupled receptors? Curr Biol 6:211–212. (1999) Whither goest the RGS proteins? Crit Rev Biochem Mol Biol 34:215–251. (1998a) GTPase activating specificity of RGS12 and binding specificity of an alternatively spliced PDZ (PSD-95/Dlg/ZO-1) domain. J Biol Chem 273:17749–17755. (1998b) A G protein gamma subunit-like domain shared between RGS11 and other RGS proteins specifies binding to G beta 5 subunits. Proc Natl Acad Sci USA 95:13307–13312. (2000) Structural basis of the Axin-adenomatous polyposis coli interaction. EMBO J 19:2270–2279. (1989) Muscarinic activation of potassium channels in cardiac myocytes: kinetic aspects of G protein function in vivo. Trends Pharmacol Sci Suppl:46–49. (1997) Structure of RGS4 bound to AlF4−-activated Giα1: stabilization of the transition state for GTP hydrolysis. Cell 89:251–261. (1998) Mechanisms of Wnt signaling in development. Annu Rev Cell Dev Biol 14:59–88. (1998) The N-terminal domain of RGS4 confers receptor-selective inhibition of G protein signaling. J Biol Chem 273:34687–34690.